City officials are asking Montrealers to avoid several blocks around Peel Street in the south end of downtown Montreal as crews repair a massive water main break and try to stop the water from spreading. 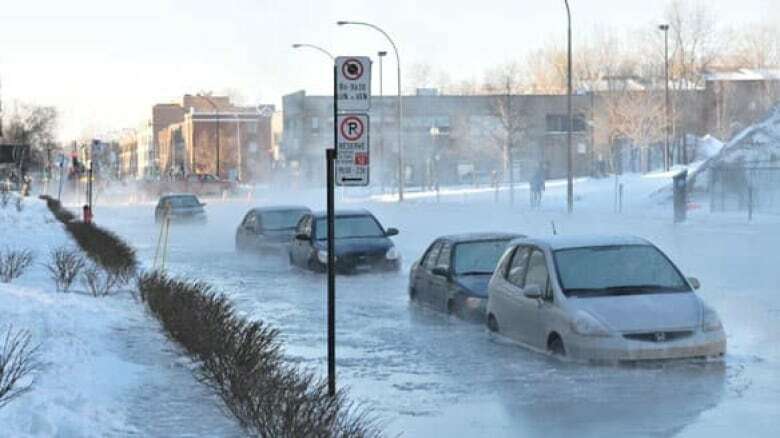 Vehicles sit in freezing water in downtown Montreal on Friday after a water main break. ((Submitted by Mac Pham))City officials are asking Montrealers to avoid several blocks around Peel Street in the south end of downtown Montreal as crews repair a massive water main break and try to stop the water from spreading. A one-block radius around the intersection of Peel and St-Jacques streets, where the water main broke, is expected to remain closed until the end of the weekend. The affected roads include St-Antoine, De la Cathédrale and Des Rivières streets. The water main, which dates back to 1891, broke early Friday morning, sending a fountain of water shooting into the air. More than one person got soaked trying to cross St-Jacques where the water reached depths of more than one metre in some spots. Anne-Marie Héroux, who works at the nearby federal building, regretted taking the chance to cross the street. "When I walked in the water, I realized the water went up to my knees. After that I just fell down. In other words, I am totally wet. 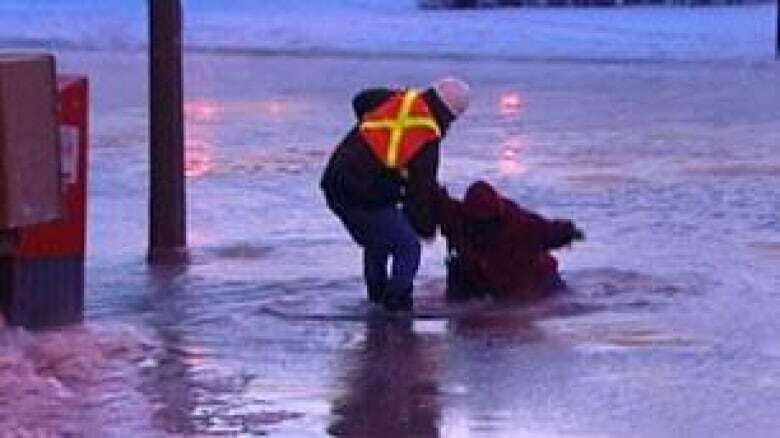 I don't know what I'm going to do," Héroux told CBC News after a city worker helped her onto dry ground. City trucks moved snow into the area to build a dam to prevent the water from spreading farther, including into the nearby Ville-Marie Tunnel. "What we are looking at is a dam made of snow," said Jacques-Alain Lavallée, who speaks for the borough of Ville-Marie. "Fortunately we had not collected all the snow [from the latest storm], so that has become extremely useful. The dam prevents the water from spreading east of Peel [where there is] the access to the Ville-Marie Expressway,"
The break at Peel and St-Jacques was the 19th in as many days in Montreal. Aging pipes have been giving way as temperatures drop to lows between –20 C and –35 C, levels Montrealers rarely see even in the coldest of winter months. "The temperature we are experiencing is exceptional for us," said Sammy Forcillo, the city's executive committee member in charge of infrastructure. Forcillo said the recent rash of water main breaks in Montreal should be a reminder to the federal government of the pressing need to help municipalities repair aging infrastructure. The city will spend $350 million this year to fix underground water pipes. The city estimates 1,400 kilometres of underground pipe need upgrades, at a cost of $20 billion.